I have some growing and I have heard a lot of people love it. This is my first time with I recently picked some along with some Swiss Chard and made a salad with them. I must say Arugula is some tasty stuff a bit strong with a nutty flavor I believe it's hard to nail down. It smells so good too in the garden. Like I said it's kinda strong, I should have mixed it with some more milder lettuces. Just though I would put this out there for you guy's. I can't get that smell out of my head, it's heaven. Never tried it, but I think I'd have to give it a go. Sounds like a great flavor! More than likely work well in a container. They say it is very easy to grow, as a matter of fact it is very pest and disease free from what I read. It is the ONLY thing in my garden NOT getting attacked by something. But like I said it pretty strong and should be mixed with more mellow lettuce in my opinion. Every where I read it is called "peppery" and "bitter" but I find it neither, maybe just me. Just lovely. If you plant it enjoy, oh and now is a good time it is a cool season veggie, actualyl an herb but it is lettuce to most peolpe. Do some research it's been famous for centuries. My arugula is coming right along in a couple of "curbside recycled" containers on the front porch. I just planted round 2 this weekend. I should have something ready to pick in another few weeks. Rocket grows like wild fire! In this small container I grow both Swiss Chard and Rocket which produces an edible crop in 4 weeks and enough for 3 meals a week for 2 people. I grow arugula year round. We dearly love it. And when harvesting, crinkle the leaves in your hand and smell the wonderful aroma. Arugula gets quite spicy during hot weather, but is mild when growing in the spring and fall. I was quite excited to find two new varieties the other day at seeds savers exchange. They have a variety called 'Apollo' which is an improved form of 'Rocket' that has a milder flavor. They also have a variety named 'Sylvetta ' which is slower to bolt in the summer. We eat straight arugula salad, usually with tomatoes and mushrooms, but we also blend arugula into our favorite salad greens mix. The leaves are great on a sandwich and are also great when added as a pizza topping. We simply love arugula, and I can keep it growing twelve months per year here in central S.C., zone 8. Here is a link to the seed savers listing. Arugula is a mustard. It has a flavor similar to mustard greens. I like a leaf on a sandwich or a little in a green salad. That's funny, SP8 I have my arugula and swiss chard growing together as well. Looking good there bro. They go great together. hendi_alex I love the smell too. I have never grown it before. I saw it growing and not not over excited to pick any at that time. Then I picked a leaf just to give it a wiff. Well that night i made a salad of that and Swiss chard. It smells so dang good kind like how I think basil smells. The 2 most wonderful smells I know. Yeah what he said. It grows amazingly well, and like I said for the most part pest and disease free. Plus amazing flavor, you can't lose. Youve inspired me to plant some arugula. Do they grow good in the ground or am I better off planting them in a pot? Only prob with the pot is I don't have a sunny place to put it unless I put it on the ground outback next to my garden where the sun hits.If arugula is mixed with swiss chard would that combo make a good salad without being too overpowering? I don't know much about either. Maybe I should invest in 2 large plastic pots. One for my swiss chard and arugula and the other for my spinach. Can these be grown all year around? Im in California...does this benefit me? Arugula is a relatively small plant and lends itself well to container culture. 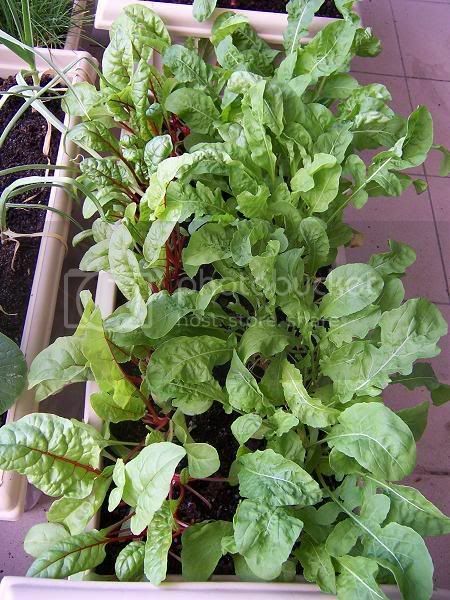 Swiss chard on the other hand is quite large with each plant probably needing two or three gallons of soil. Both plants will likely grow year round in your area, but hot weather often causes arugula to get peppery or strong flavored. Hot, dry weather also stimulates seed production or bolting in arugula, so you would need to have several succession plantings to keep these greens growing year round. Swiss chard would perhaps make it through your somewhat mild summers, but I'm always in favor of planting a batch of fresh vigorous plants as older plants sometimes get tired and cause production or leaf quality to suffer. Last edited by hendi_alex on Fri Sep 18, 2009 1:29 pm, edited 1 time in total. can I plant more lettuce? Lettuce has bolted - What to plant now? Zone 7. When to plant lettuce from seed?